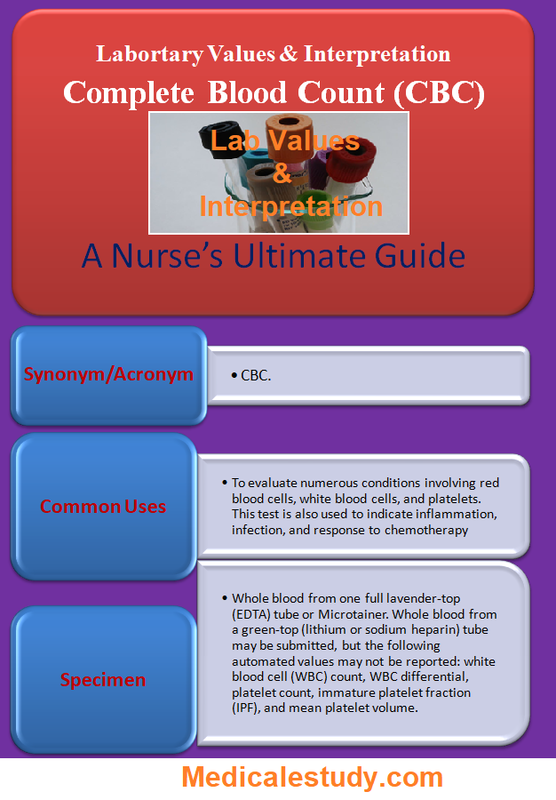 Memorizing and interpreting Laboratory values for nurses is not so easy. With the help of following right tips you’ll be able to memorize and complete your tasks easily. 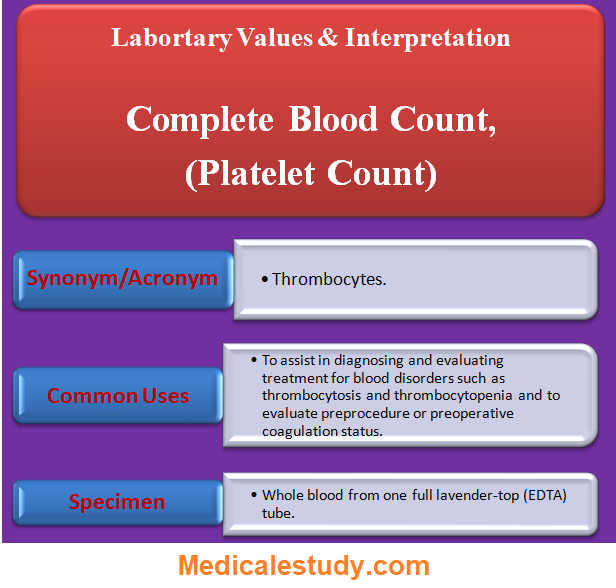 A complete blood count (CBC) is a group of tests used for basic screening purposes. It is probably the most widely ordered laboratory test. Results provide the enumeration of the cellular elements of the blood, measurement of red blood cell (RBC) indices, and determination of cell morphology by automation and evaluation of stained smears. The results can provide valuable diagnostic information regarding the overall health of the patient and the patient’s response to disease and treatment. 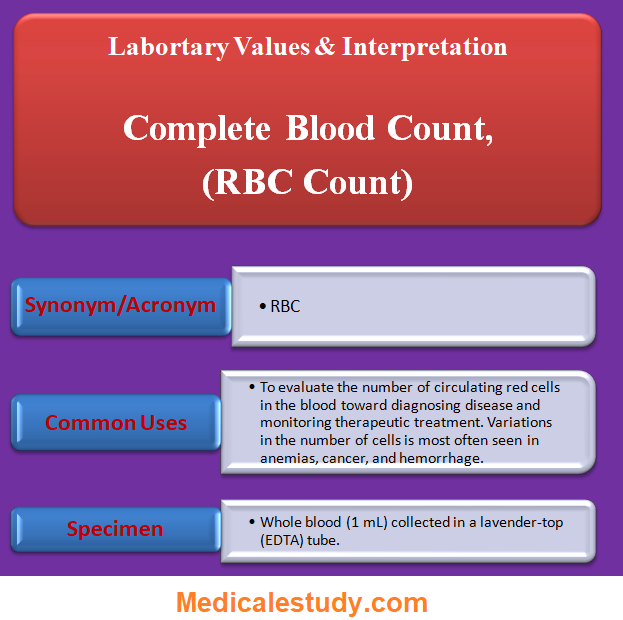 The red blood cell (RBC) count is a component of the CBC. It determines the number of RBCs per cubic millimeterof whole blood. The main role of RBCs, which contain the pigmented protein hemoglobin (Hgb), is the transport and exchange of oxygen to the tissues. Some carbon dioxide is returned from the tissues to the lungs by RBCs. RBC production in healthy adults takes place in the bone marrow of the vertebrae, pelvis, ribs, sternum, skull, and proximal ends of the femur and humerus. Production of RBCs is regulated by a hormone called erythropoietin which is produced and secreted by the kidneys. Normal RBC development and function are dependent on adequate levels of vitamin B12, folic acid, vitamin E, and iron. The average life span of normal RBCs is 120 days. Old or damaged RBCs are removed from circulation by the spleen. The liver is responsible for the breakdown of haemoglobin and other cellular contents released from destroyed RBCs. 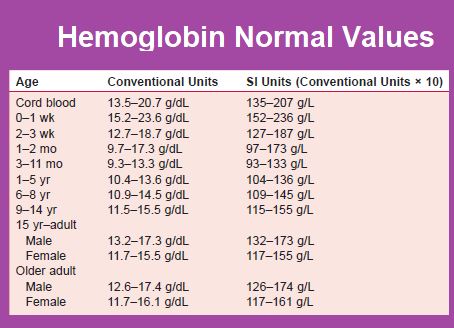 Hemoglobin (Hgb) is the main intracellular protein of erythrocytes. It carries oxygen (O2) to and removes carbon dioxide (CO2) from red blood cells (RBCs). It also serves as a buffer to maintain acid-base balance in the extracellular fluid. Each Hgb molecule consists of heme and globulin. Copper is a cofactor necessary for the enzymatic incorporation of iron molecules into heme. Blood consists of a liquid plasma portion and a solid cellular portion. The solid portion is comprised of red blood cells (RBCs), white blood cells (WBCs), and platelets. It is important to be able to assess whether there is a sufficient number of circulating RBCs to transport the required amount of oxygen throughout the body. 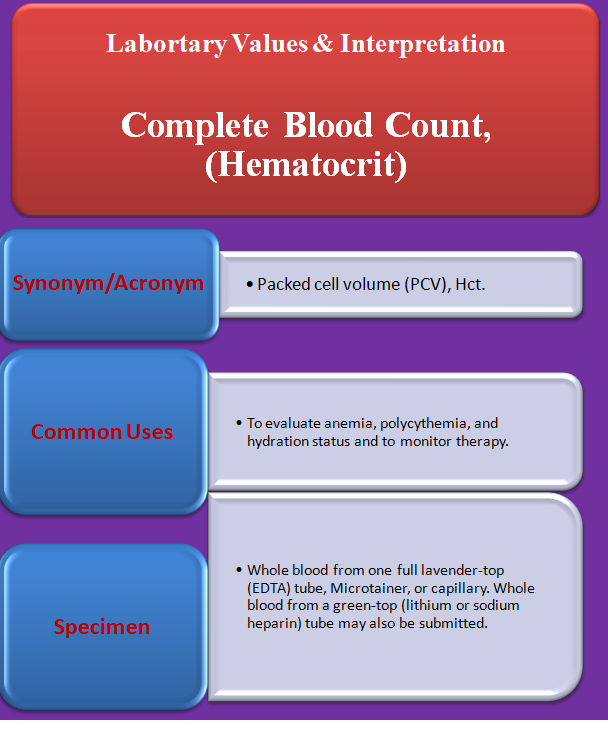 The hematocrit (Hct) is a mathematical expression of the number of RBCs, or packed cell volume, expressed as a percentage of whole blood. 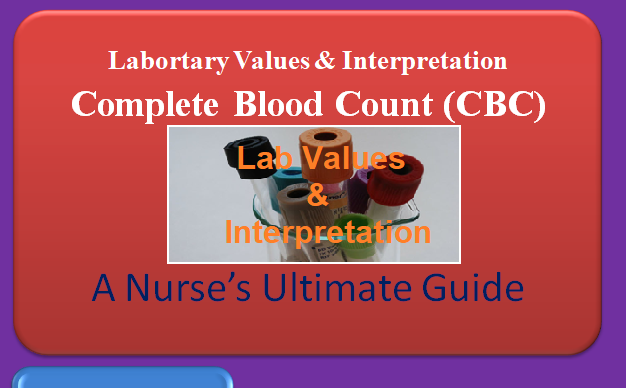 For example, a packed cell volume, or Hct of 45% means that a 100-mL sample of blood contains 45 mL of packed RBCs, which would reflect an acceptable level of RBCs for a patient of any given age. 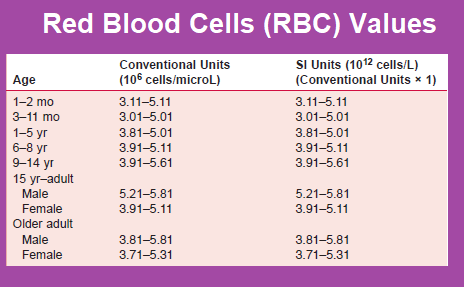 The Hct depends primarily on the number of RBCs, however the average size of the RBCs influences Hct. Conditions that cause RBC size to be increased (e.g. swelling of the RBC due to change in osmotic pressure related to elevated sodium levels) may increase the Hct while conditions that result in smaller than normal RBCs (e.g. microcytosis related to iron deficiency anemia) may decrease the Hct. Hematocrit can be estimated directly by centrifuging a sample of whole blood for a specific time period. As the blood spins it is separated into fractions.The RBC fraction is read against a scale. 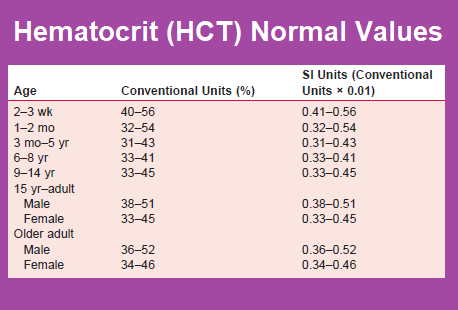 Most often the Hct is measured indirectly, by multiplying the RBC count and mean cell volume (MCV), using an automated cell counter. 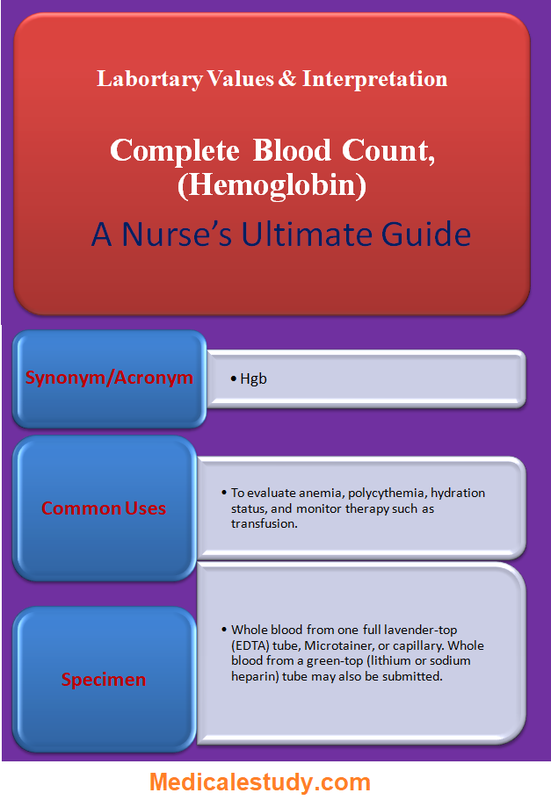 Hct can also be estimated by multiplying the hemoglobin by three. Platelets are nonnucleated, cytoplasmic, round or oval disks formed by budding off of large, multinucleated cells (megakaryocytes). Platelets have an essential function in coagulation, hemostasis, and blood thrombus formation. Activated platelets release a number of procoagulant factors, including thromboxane, a very potent platelet activator, from storage granules. 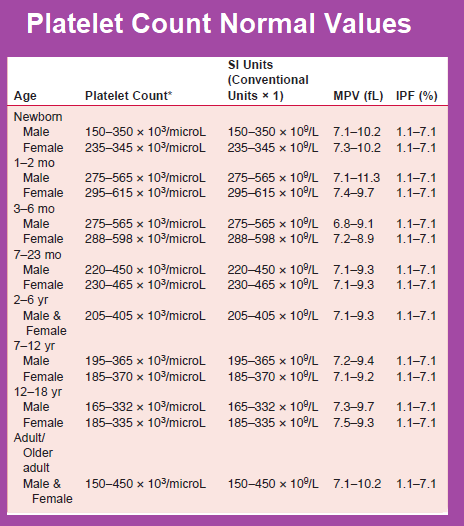 These factors enter the circulation and activate other platelets and the cycle continues. The activated platelets aggregate at the site of vessel injury, and at this stage of hemostasis the glycoprotein IIb/IIIa receptors on the activated platelets bind fibrinogen, causing the platelets to stick together and form a plug. White blood cells (WBCs) constitute the body’s primary defense system against foreign organisms, tissues, and other substances. The life span of a normal WBC is 13 to 20 days. Old WBCs are destroyed by the lymphatic system and excreted in the feces. Reference values for WBC counts vary significantly with age. WBC counts vary diurnally, with counts being lowest in the morning and highest in the late afternoon. Other variables such as stress and high levels of activity or physical exercise can trigger transient increases of 2–5 × 103/ microL. The main WBC types are neutrophils (band and segmented neutrophils), eosinophils, basophils, monocytes, and lymphocytes. WBCs are produced in the bone marrow. B-cell lymphocytes remain in the bone marrow to mature. T-cell lymphocytes migrate to and mature in the thymus. 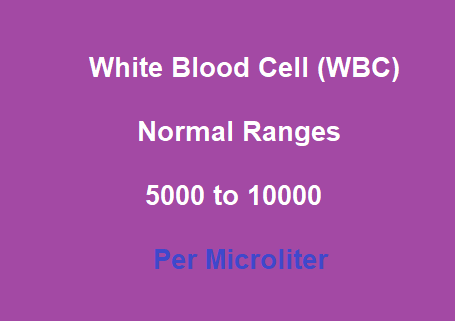 The WBC count can be performed alone with the differential cell count or as part of the complete blood count (CBC).